Now that our canvas was all clean and smelling fresh, we decided to tackle our dirty vinyl windows. 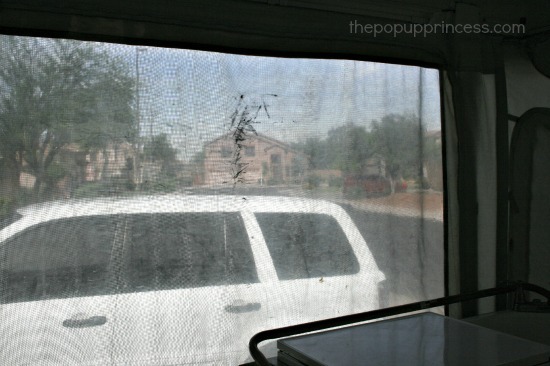 When we got the pop up camper, the windows were filthy, and now they really seemed to stand out against the clean canvas. I wasn’t sure we’d ever get them sparkling clean, but I was determined to try. There were several large black marks on the windows (you can see them in the picture above) that we weren’t sure were going to come out. 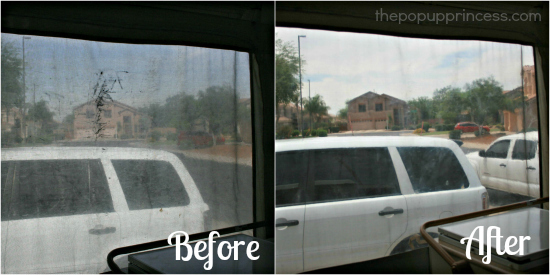 Even if they did, we were prepared to have hazy, yellowed windows even after we’d cleaned them. We couldn’t imagine finding anything that would really get these babies clean. We had a section of our canvas repaired at the local awning shop, and when I asked what they recommended to clean those clear vinyl windows, they told us that we should only use water and a gentle soap. We were prepared to do just that, but then I remembered the Protect All that we used on the vinyl on the outside of the trailer. It was actually meant to clean and protect vinyl, and since it did such a great job on the outside, I decided to try it on our windows. We used the same method here that we used on the outer vinyl. Mr. TypeTwoFun applied it with a clean, white sock. Then I went back with a clean, dry sock and buffed it out. If you get streaks, reapply the cleaner, wipe clean, and buff again. We cleaned and buffed both the inside and outside of the windows. Here you can see just how well it worked. The Protect All removed the dirt and dust, all the black marks, water spots, and even the yellowish haze that was coloring the vinyl. It was unbelievable how well it cleaned these windows. See? No more black marks or hazy discoloration. It’s hard to capture in pictures, but these windows are crystal clear. They look like brand new windows. We are constantly amazed how a little elbow grease and the right product can take a 15 year old camper and make it look new again. This product also works great on the vinyl windows of a boat enclosure, even if the boat is used in sea water! Thank you so much for all your ideas and recommendations, they are great, specially for new camper owners like my husband and I. I was wondering if you knew where I can order the screen portion for the camper or a big repair kit. We bought an old 1996 Viking pop up and discovered it is missing the screen on the whole back side where the bed is. If anyone can help. I’ll appreciate it. There is a company that Jayco tells folks to go to for repair materials. Veada.com has vinyl window screen material as well as cream cotton canvas, vinyl fabric, clear vinyl window material, and bungee chord by the yard. Just look at the bottom of their menu for the category: tent camper materials. Good to know! Thanks, Julie! Your site has given me lots of ideas! Thank you!! 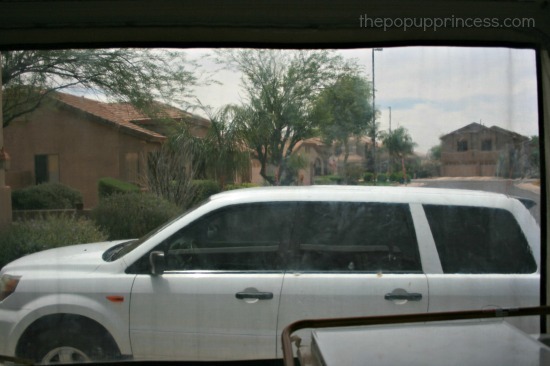 Quick question though — do you know if the vinyl cleaner is safe on tinted vinyl? Where can i find this majic stuff? Walmart has a RV section? Thanks. Just bought a used camper this week and excited to use your ideas on fixing her thank you so much! You’re too cute, Paula! I’m blushing! 😉 Glad you like the blog! Great website. I’ve learned so much in 45 min, on how to clean and waterproof our new used pup. I was discouraged at the pin hole leaks and musty smell. It’s now clear that there are a number of products and methods to improve these issues. Thanks very much!!!! D.
We just bought a used 2011 rock wiid freedom and we are new to camping. My one concern is how to clean canvas on inside bunks. . Do I use woolite? I have a few black. Specks . Do I use the protect all on vinyl parts if canvas inside and out? Some people recommend oxiclean. Have you tried it before? Are the black specks mildew or grease/dirt, Jody? 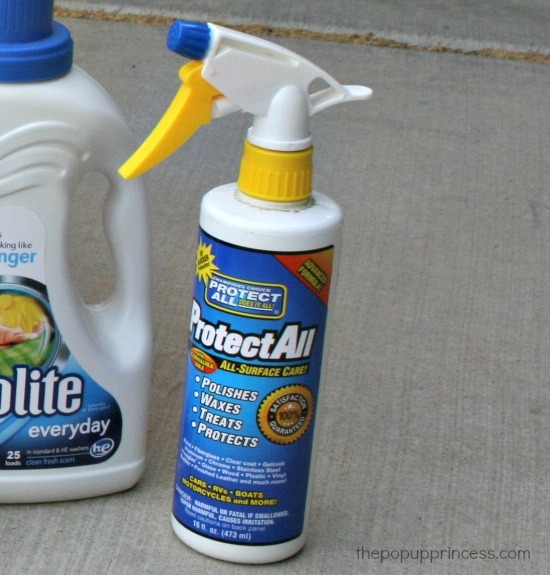 How you clean them will depend on what they actually are. Rockwood suggests Oxyclean, I believe for their canvas. Definitely check with the manufacturer, because they all use different fabrics and have different recommendations. 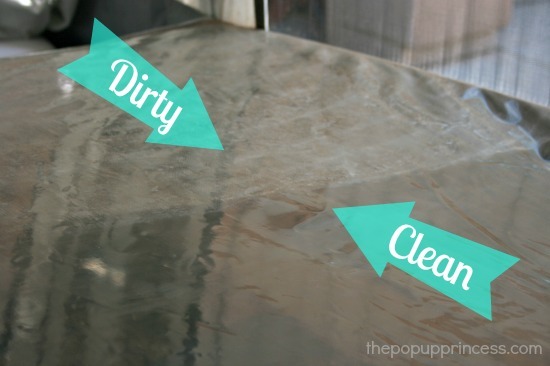 Here’s a how we clean our canvas–inside and out–but it is Sunbrella fabric. It may not apply to your tenting. Hmmm… What do you mean by not fitting to the drop down door? Are you sure the camper itself is level and the roof is level on all four ends and doesn’t need to be adjusted? First off- thank you so so much for all of your posts! My family and I have been tent campers for years and years and decided to buy our first PUP this year. We went with a newer model, 2012 Rockwood Forest River. It’s only an 8 ft box, so I’ve been loving all of your organization tips! We went out for the first time last week and it rained and rained. The canvas Windows on each bed end (full and twin sized) leaked from all the rain. I purchased some bass pro shop canvas waterproof spray that I want to use. Im a little confused though. I’m assuming I unzip my windows down and spray the waterproofer on the outside portion of the Windows. I shouldn’t just spray from the outside, through the window mesh? All the talk about not getting the vinyl wet and such has made me a tad nervous. Any helpful tips on how to clean the water holder in pop up? Do you mean the fresh water tank, Tammy? 🙂 Here’s a link you might find helpful. One and only one of our vinyl windows is yellowish. Do you think this product would help get out the yellow or should I do something to get the yellow out first? BTW, thank you for your blog. I have used it more in the last 2 weeks than I ever thought I would read a blog. We bought a pop up camper 2 weeks ago only to find that what we thought would be a simple new flooring replacement turned into a huge remodel. I never knew camper remodel was a thing but have learned so much and kinda want to do another one sometime. 🙂 Thank you for your help! I can’t tell you just how much this blog has helped us out! My parents just bought a super tiny pop up for my mothers CR-V to haul. It’s a Coleman Roanoke and all of these tips are so great for us beginners! Especially with the remodeling side. Where can I purchase Protect All? The windows aren’t that bad but I want to just this thing look as good as I can! 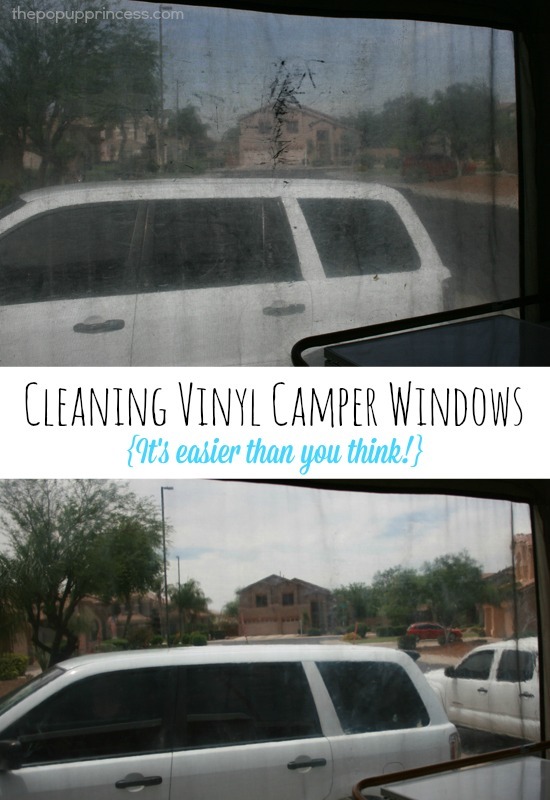 I see 303 (brand you’ve mentioned in other posts) has a clear vinyl cleanser & protector….have you tried this on your windows? I will probably attempt this on ours and thought I’d ask. THANK YOU for sharing your popup journey…we bought our ’09 Coleman last summer and I had no idea what we were supposed to do for maintenance until I stumbled upon your blog 2 nights ago. Since then we’ve upgraded our mattress, bought the 303 products (now waiting for the storm to pass so I can work on the windows), magic erasered the entire exterior and hope to reupholster before we leave on the 2nd for this year’s trip to CO, WY, SD. 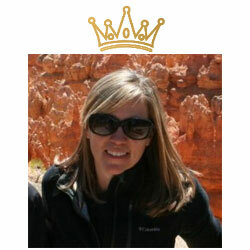 So thankful for your blog as a resource!! This page it’s amazing , thank you so much, it really helping me with our new adventure. We recently got a 2003 Coleman mesa pop up camper , but the clear vinyl it’s kind of yellow, I believed was from the leak they had there before. Do you think this product will help bring the color back to clear ? Thank you so much for all the advice and pictures! You have inspired me to finally get to work on our 2001 Westlake Coleman PUP. I LOVE the Protect All- it’s so satisfying making all the vinyl clean and shiny! I made the mistake of using a Magic Eraser on my vinyl windows though, and left some dull spots, so I wanted to warn others about that. (BTW-This was NOT a suggestion by Larissa-it was my own silly idea). I had no idea Magic Erasers are a bit like sandpaper and can dull some surfaces, like clear vinyl windows. Other than that, the rest of my vinyl, that I cleaned the right way, looks fabulous. 🙂 Thanks again! Larissa, We have a 2003 Flagstaff we bought 2 years ago. We were very lucky to find a pup that old in great condition. The vinyl windows are still like new, but had water spots and grime. I was afraid to clean them as I didn’t want to scratch them. I got the Protect All and cleaned using socks, just as you instructed. We have the very dark tinted windows, so everything shows. They are clean, clean, CLEAN! It made such a huge difference. I’m so happy! You should be the pop-up Queen! Thanks so much!